To Cite: Banaei A. The Comparison between Digital Subtraction Angiography, CT Angiography, and Doppler Ultrasonography in Evaluation and Assessment of Carotid Artery Stenosis, Ann Mil Health Sci Res. 2017 ; 15(1):e61661. doi: 10.5812/amh.61661. Background: Common angiography or digital subtraction angiography (DSA) is the gold standard protocol for diagnosis of carotid artery stenosis. However, this method has very high delivered X-ray doses to patient and personnel as an invasive diagnostic protocol. The progress of noninvasive or minimally invasive diagnostic techniques like Doppler ultrasonography (DUS), CT angiography (CTA), and MR angiography (MRA) has improved the detection and evaluation of stenosis lesions. The aim of this study was to evaluate the usefulness and accuracy of non-invasive DUS and CTA, attempting in this way to restrict DSA only for final proof of high-grade stenosis. Methods: 25 male patients with carotid artery stenosis were examined with CTA, DUS, and DSA. 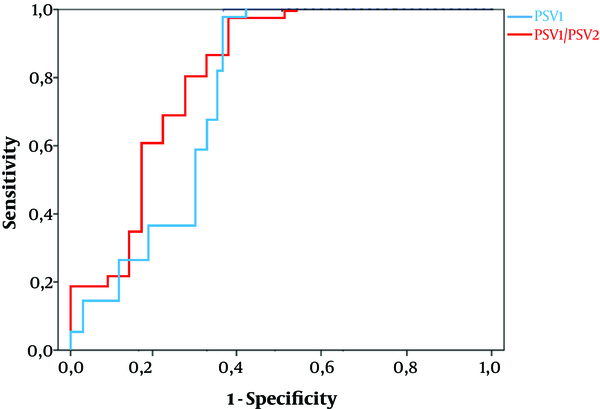 The lumen diameter of carotid artery was measured and compared with CTA and DUS. The results of CTA and DUS were compared and correlated with DSA results as a reference. Results: Data of lumen diameter measurements in ultrasonography and CTA (for internal and common carotid artery) showed no significant differences between the two methods. Mean internal/common lumen artery in stenosis region was 3.745/5.114 and 3.643/5.000 millimeters for CTA and DUS, respectively. The results (mean ± standard deviation) of moderate to severe carotid stenosis obtained from CTA, DUS, and DSA in stenoses ≥ 50% were 67.8 ± 10.82, 65.6 ± 13.25, and 71.2 ± 11.2 (in percentage), respectively. The Spearman correlations of CTA and DUS results with DSA results were 0.865 and 0.812, respectively. Conclusions: Significant correlations were found in our study between CTA/DSA and DUS/DSA. We showed that the accuracy of CTA and Doppler ultrasonography was appropriate in comparison with DSA results for male patients with carotid stenosis ≥ 50%. We also showed that measurement of PSV could be a good parameter for evaluating carotid stenosis like PSVr in Doppler ultrasonography. Carotid artery disease or carotid artery stenosis is one of the common causes of stroke or cerebrovascular accident (1, 2). Early diagnosis of this disease can lead to better and more effective treatment (3, 4). Common angiography or digital subtraction angiography (DSA) is the gold standard protocol for diagnosis of the carotid artery stenosis. Angiography procedure has one of the most invasive protocols and has very high delivered X-ray doses to patient and personnel (5). With the progress of noninvasive or minimally invasive diagnostic techniques like ultrasonography, MR angiography (MRA), and CT angiography (CTA), as various dose reduction techniques (6), the detection and evaluation of stenosis lesions improved (7-10). The advantage of angiography is that the angioplasty procedure can be implemented at the same time. However, due to the relatively small percentage of patients who have indication of angioplasty, the diagnostic procedures should be as non-invasive and safe as possible. The first method of choice for screening and diagnosis of carotid artery stenosis is ultrasonography (US). This is a noninvasive and non-ionizing imaging method of hemodynamic measurement. However, its accuracy depends on the user skill and especially on a well-defined examination procedure (11). After the ultrasonography examination and determining suspected patients, the second choice is either CTA or MRA. DSA usually is performed for final approval as a gold standard protocol due to its high X-ray dose delivered to patient and personnel. With technological improvements in CTA, MRA, and US methods, the accuracy and sensitivity of these methods have improved and the need for angiography as a gold standard has been questioned in some investigations (7-10). Some studies reported CTA and contrast-enhanced MRA as more sensitive methods for detection of vertebral stenosis (12), while others showed a low degree of concordance between CTA or MRA on the one side and ultrasonography on the other side (13, 14). On the contrary, some singular studies, using ultrasonographic hemodynamic criteria in an exact examination protocol, have found that the ultrasonography and Doppler sonography results were highly comparable with those of DSA (15, 16). Although DSA is still considered a gold standard with the advantage of enabling an immediate angioplasty, it is accompanied with non-negligible risk and discomfort for the patient. Therefore, CTA and contrast-enhanced MRA are routinely used as second reference mini-invasive methods. The aim of this study was to evaluate the usefulness and accuracy of the non-invasive DS and CTA, attempting in this way to restrict DSA only for final proof of high-grade stenosis. 25 male patients suspected to have a carotid artery stenosis lesion based on DUS participated in this study. The study protocol conformed to the ethical guidelines of the 1975 declaration of Helsinki. All of the patients were informed about all the examination procedures and data analyzing. They signed an informed consent form. These patients were examined prospectively by DUS and CT-angiography. For proving, the diagnosis DSA was performed as a gold standard protocol, only in patients with suspected carotid artery stenosis ≥ 50% based on CTA and DUS. A Toshiba Core-Vision pro with a linear array multifrequency transducer (5 - 10 MHz), an additional convex transducer for imaging of the carotid artery, and another phased array transducer (2 - 3.5 MHz) were used for Doppler sonography of the carotid artery. The peak systolic velocity (PSV), end-diastolic velocity, time-averaged velocity (Vmean), and the index of pulsatility were measured and calculated with the analysis of the results. The diameter between the lumen-intima reflections of the anterior and posterior walls was measured without the color Doppler image. Measurements were performed in two different regions, one of them in the suspected stenosis region and the other 15 mm below the first one. All of the CTAs were performed with a 16-slice machine (BrightSpeed 16, General Electric Company) with intra vascular infusion of contrast media (iodine compounds) and bolus tracking protocol with ECG gated to eliminating the movements from heart beating. Reconstructions of V0, V1, and V2 segments were performed. The reduced lumen diameter was measured in the most pronounced stenotic area (d1). Next, the normal lumen diameter was assessed in the V1 segment distally from the stenosis, in the same spot with the sonographic measurement (d2). The measurement was performed on a scan perpendicular to the longitudinal axis of the vessel (from the axial source scans and curved multiplanar reconstructions). The degree of the stenosis was established as percentage of the VA lumen reduction over the lumen diameter. Digital subtraction angiography (DSA) was performed with intra-arterial contrast agent as a gold standard protocol, only in patients with suspected carotid artery stenosis ≥ 50% based on CTA and DS. In order to check the accuracy for stenoses ≥ 50%, Lumen diameters were measured in the same regions as for CT angiography. In the stenotic region of carotid, the measured lumen diameter of carotid artery by DUS was compared with CTA, using paired t-test. The peak systolic velocity was evaluated (PSV1) for each patient and the ratio of the stenotic to the post stenotic peak systolic velocity was calculated (PSVr = PSV1/PSV2). These parameters were appropriate indicators of stenosis based on previous studies (7, 15-17). Previous ultrasound studies (7, 15-17) proved that the stenotic PSV and/or PSVr is superior to end-diastolic velocity and other hemodynamic parameters. The degree of the carotid artery stenosis measured on CTA was taken as the reference parameter. The curves of receiver operating characteristic (ROC) were used for the analysis of duplex findings (PSV1 and the ratio of PSV1/PSV2). We examined the area under the curve (AUC) for carotid artery stenoses ≥ 50%. Finally, we compared the results of CTA in 17 moderate to severe VA stenoses with those of gold standard DSA using Spearman’s correlation. The statistical calculations were done using SPSS version 16 software for statistical significance values of P < 0.05. With utilization of CTA, mild carotid stenoses (< 50%) were found in 8 patients (32%) and moderate and severe ones (50% - 99%) in 17 (68%) subjects. Data of lumen diameter measurements obtained from ultrasonography and CTA are shown in Table 1 (for internal carotid artery) and Table 2 (for common carotid artery). The paired sample t-test showed no significant differences between the two methods. Figure 1 shows the sensitivity and specificity of selected hemodynamic parameters using the ROC analysis for carotid stenoses ≥ 50%. The area under the curve (AUC) for PSV1 (0.784) was nearly the same as that for PSV1/PSV2 ratio (0.819). Figure 1. Sensitivity and Specificity of Selected Hemodynamic Parameters Using ROC Analysis for Carotid Stenoses ≥ 50%: Peak Systolic Velocity in the Carotid Artery Stenosis (PSV1) and Peak Systolic Velocity Ratio (PSV1/PSV2 = PSV Stenotic/PSV Post-Stenotic). The results for moderate to severe carotid stenosis obtained from 3 different techniques (DSA, CTA, and DUS) are shown in Table 3. Finally, the correlations of CTA and Doppler ultrasonography results with DSA results in stenoses ≥ 50% were calculated and shown in Table 4. The Spearman correlations of 0.865 and 0.812 (P < 0.001) were highly significant. Digital subtraction angiography (DSA) with arterial contrast application is still considered the ‘‘gold standard’’ in evaluation of carotid stenosis. Noninvasive or minimally invasive methods including CTA, MRA, and Doppler sonography are now considered as alternative methods in many diagnostic centers with prescription of color duplex sonography as the first diagnostic method and CTA or MRA as a second choice (7). A meta-analysis of 11 studies comparing sensitivity and specificity of these imaging methods with those of DSA for stenoses ≥ 50% demonstrated that CTA sensitivity could approach almost 100%; while, MRA and CDS achieved 93.9% and 70.2%, respectively. The data were relatively heterogeneous. The specificity of CTA, MRA, and CDS was comparable: 95.2%, 94.8%, and 97.7%, respectively (12). Other studies reported 94% sensitivity and 88% specificity for multi-detector CT angiography in VA stenoses ≥ 50%. Calcified stenoses in the VA origin can be found by CTA even more easily than by DSA (18). In an investigation, Puchner et al. emphasized the high quality and feasibility of multi-detector CTA for diagnosis of vertebral stenoses; however, the correlation value between CTA and DUS was moderate (kappa 0.56). The authors explained that this may be due to limitations of ultrasonographic methods in their centers (13). Other studies compared the accuracy of DUS and DSA as a reference, regarding hemodynamic parameters, especially on blood flow velocities (7, 15-17). In another study by Koda et al. (7), the significant correlation value of 0.823 was found between CTA and DSA in vertebral artery stenosis diagnosis. They recommended that CTA could replace DSA as gold standard, allowing DSA to reserve only for persons with an intended endovascular intervention. This value in our study was 0.865. In addition, we found a significant correlation (0.812) between Doppler sonography and DSA, too, indicating that DUS can be an alternative noninvasive method for evaluating carotid stenoses > 50%. The reason for obtaining this powerful correlation between Doppler sonography and DSA, when compared to other investigations (7, 10, 14, 16, 17), may be that we used hemodynamic parameters that were most appropriate regarding previous studies to find reliable hemodynamic parameters in the evaluation of artery stenosis. In one retrospective analysis, peak systolic velocity (stenotic PSV) was selected as the most accurate criterion in detection of VA stenosis ≥ 50% (17). In this study, the ratio between PSV in stenosis and PSV in more distal segments of artery was not considered better than the stenotic PSV itself. In a large monocentric study, Hua et al. compared CDS with DSA findings, looking for cut-off values of PSV and their ratios, showing that there were no significant differences between PSV and PSVr, as shown in our study (15). Significant correlations were found in our study between CTA/DSA and DUS/DSA. We showed that the accuracy of CTA and Doppler sonography was appropriate in comparison with DSA results for male patients with carotid stenosis ≥ 50%. We also showed that measurement of PSV could be a good parameter for evaluating carotid stenosis like PSVr in Doppler ultrasonography. Regarding our results as well as previous study findings, CTA and DUS may have a high potential for assessment of carotid stenosis. With the progress of their technology, they can replace DSA for patients with no need of angioplasty. Conflict of Interest: No potential conflict of interest was reported by the authors.